Yesterday’s earthquake in Eastern Turkey (near the City of Van) has resulted in extensive damage due to it’s shallow depth, it’s large magnitude (M 7.2), and it’s proximity to populated areas (well over 300,000 people living within 10 miles of the epicenter). Combine that with not-so-strict building codes and the region’s geology, and you’ve got problems. Unfortunately, no time on my end to write much about the mechanisms and consequences of the quake…but if you’d like to learn more, this post by Chris Rowan is a good place to start. Rowan specializes in tectonics and is one of the authors on Highly Allochthonous – another great geology blog that I recommend reading. Something else you may want to check out is this powerpoint presentation by the University of Pittsburgh’s Department of Geology and Planetary Science, which presents seismograph records from the Oct 24, 2001 earthquake in Turkey, and discusses the geology of the region as well. (Note that the conversion into google docs seems to have changed the aspect ratio and jumbled the text on some of the slides). 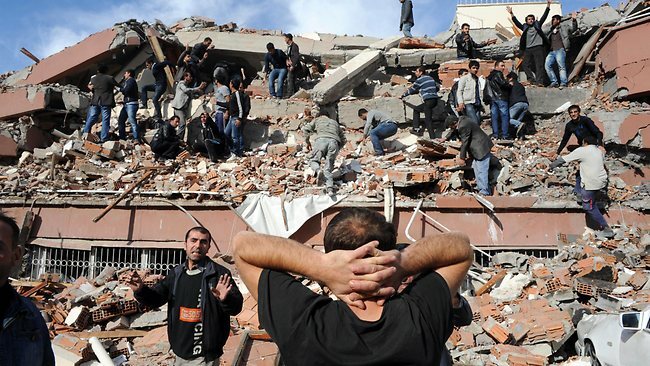 You can also find lots more detailed info about the Turkey earthquake on the USGS website. For those of you who don’t need all the nitty gritty, don’t forget you can find a quick crash course in plate tectonics in some of my previous posts – like this one.